Koch brothers won’t bail out Republican Party by spending big to stop Trump. 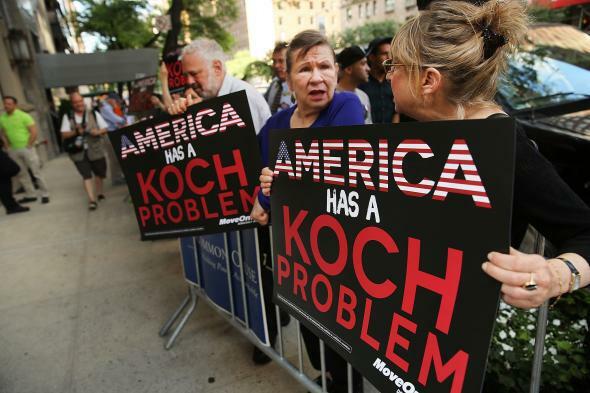 Activists hold a protest near the Manhattan apartment of billionaire and Republican financier David Koch on June 5, 2014 in New York City. If the Republican establishment was hoping the Koch brothers would bankroll a political bailout by funding an all-out, last minute offensive to derail Trump’s path to the party nomination—it might be time to move to Plan Z? The billionaire industrialists, who have long had their way with GOP candidates, are not particularly pleased with their choices this time around—particularly Donald Trump. Even though that is a sentiment generally shared by Republican party elders, that doesn’t mean the Kochs are going to upend the race with deluge of funds to stop Trump, Reuters reports. The Koch brothers, the most powerful conservative mega donors in the United States, will not use their $400 million political arsenal to try to block Republican front-runner Donald Trump’s path to the presidential nomination, a spokesman told Reuters on Wednesday… “We have no plans to get involved in the primary,” said James Davis, spokesman for Freedom Partners, the Koch brothers’ political umbrella group… Three sources close to the Kochs said the brothers made the decision because they were concerned that spending millions of dollars attacking Trump would be money wasted, since they had not yet seen any attack on Trump stick. Trump has openly turned his nose up at the Kochs’ influence over Republican candidates. I wish good luck to all of the Republican candidates that traveled to California to beg for money etc. from the Koch Brothers. Puppets?